I watched the first programme of David Attenborough’s new series Madagascar on the television last night. As well as following the narration and admiring the stunning pictures of wildlife and scenery, I was able to check that Attenborough pronounced sifaka, indri, tenrec and other Madagascan animals in the way I would expect. It turned out that he said these names just as shown in LPD — but there was one which he pronounced in a way that I had not allowed for. That was lemur. Most people pronounce this word ˈliːmə(r). That is the pronunciation I prioritize in LPD, and it is the only form given in the Cambridge EPD and the Oxford ODP, not to mention Webster’s Collegiate and the OED. In LPD I do also include the rare and rather prissy variant ˈliːmjʊə which I must have noted somewhere. But what David Attenborough said on TV last night, repeatedly, was ˈliːmʊə. I don’t think I have ever heard that before. Etymologically, the word is ‘modern Latin’, a reconstructed singular form of the Latin plural lĕmŭrēs ‘spirits of the dead’, supposedly from the lemur’s spectre-like face (COD). The OED’s first citation in this zoological meaning dates from 1795. With such coinages there is no choice really but spelling pronunciation, hence ˈliːmə(r). 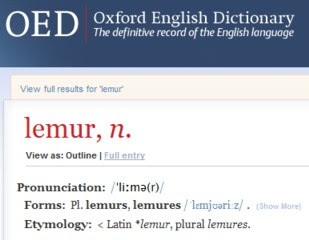 In the Latin of nineteenth-century England, though, lemures would presumably have been pronounced ˈlemjʊəriːz, and in the twentieth century ˈlemʊreɪz. So this was evidently not the determining factor in pronouncing the reconstructed singular as the name of the animal. En français on dit lémur lemyʀ; auf Deutsch sagt man Lemur leˈmuːɐ̯. I saw that too. I think it's just what you might call an "overpronunciation": the lengthening of short vowels and replacement of strengthening of weak vowels. Lots of people do it with unfamiliar words. It relies on spelling so I suppose it's a sort of spelling pronunciation. @Pete: However, one cannot assume that to DA, "lemur" is an "unfamiliar word". In het Nederlands zegt men leˈmyr of ˈmaki. Having never heard this word before, I read it as /lEm@r/ in my mind when I saw it, probably by analogy with lemon. I had no idea that the ˈliːmə(r) pronunciation was so common. I've always hovered between ˈliːmʊə(r), ˈliːmjʊə(r) and ˈliːˌmɜ:(r). I suppose I do this because lemur is such an exotic word for me that I need to anchor it to its spelling. My Russian native-speaker wife Elena has a similar attitude. As we watched the Attenborough programme, she echoed li'mur. She explains that the English pronunciation is confusingly identical with that of Lima. Funny, because I would've picked what seems to be both prissy and incorrect: /liːˈmjʊə/. I'm wondering if David Attenborough is a sufficiently influential figure that his pronunciation may gain some traction. Perhaps there are enough people self-conscious about pronouncing things "right" that they'll start to mimic him. When I first saw the title of this thread, two pronunciations came to mind, ˈliːmə(r) and ˈliːmʊə(r). I suspect that, as Josh suggests, I may have been influenced by Attenborough. From what I've read, though, there is a tendency for 'learned' words to be pronounced with open e (and o) in stressed syllables, a rule which also applies in the Italian pronunciation of Latin itself. Canepari, for instance, gives sanktifiˈʧɛtur for sanctificetur, despite the long e in Latin. That is all very well, but how did ancient Romans pronounce the word? Sorry, I didn't notice that the word didn't exist as such in ancient times. In any case, had the singular "lemur" existed, how would Romans have pronounced it? If DA was overpronouncing, it might have been a (perhaps misguided) attempt to help viewers by hinting at the spelling. I note that Google's first image matches for "leamer" are uniformly Madagascan. I wonder how would Brian Sewell pronounce it. He is a much more interesting person pronunciation-wise than Attenborough. Huh? Doesn't lemures have a stress on the antipenultimate syllable, which according to that page would be /lEm/ in English? Oh wait, the backformation was done in ‘Latin’ non in English (otherwise it'd be lemure), and lemur does have a penultimate stress. Well, for some reason sanktifiˈʧɛtur sounds ‘weird’ (or, more precisely, northern) to me. Not that I can remember ever hearing that word in Italian, with any pronunciation from anyone from any part of Italy. Yes, according to the 'rules' for traditional English Latin, the vowel would be different in the singular and the plural! @army1987: How about adeste fideles aˈdɛste fiˈdɛles?